If you were expecting strictly clothing from Mark Badgley and James Mischka's Fall 2017 runway show, think again. They had (much) more to share. The two prefaced the unveiling of their traditional glam and dressed-up sportswear with the debut of their home collection -- complete with sofas, coffee tables a credenza and lounge chairs. 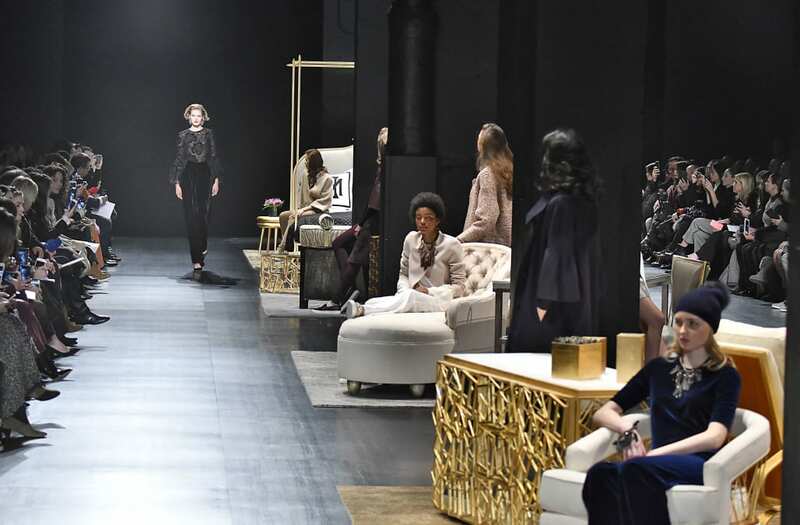 The furniture pieces adorned the runway as models strutted down sporting everything from evening gowns to a track suit and sneakers. The track suit didn't stick out like a sore thumb, though -- that's the best part about it. "We're caught between some wars right now. We went back to the time when Europe and America were between the two World Wars. It's about the women living in those uncertain times and how they used power and strength to soldier through -- it resonates today." As far as Badgley Mischka is concerned, strength can be dressed up or down -- and we're all for it.